Acting Deputy U.S. Commerce Secretary Rebecca Blank visited Savannah, Ga. yesterday, where she received a briefing on the Savannah Harbor Expansion Project (SHEP) and toured the Port of Savannah with U.S. Senators Saxby Chambliss and Johnny Isakson and representatives from the Georgia Ports Authority. Following the tour, Blank delivered remarks on the importance of projects like SHEP, an efficient, high-tech export engine that will help U.S. businesses compete globally, as part of President Obama’s National Export Initiative (NEI). 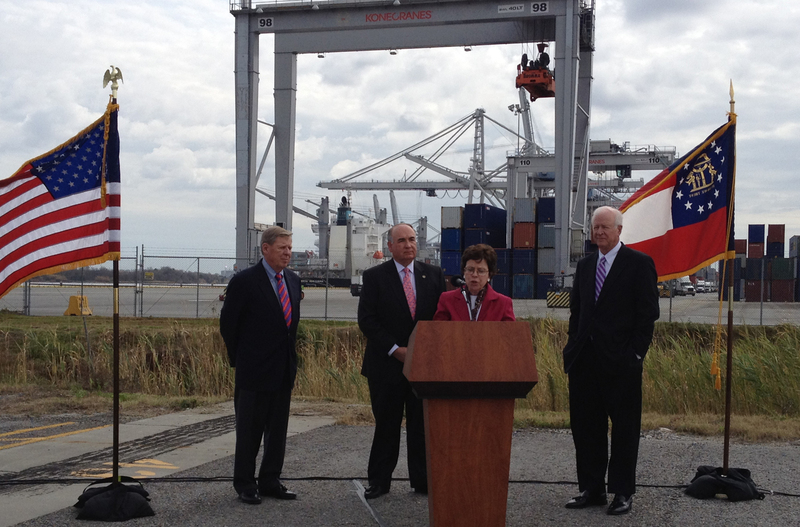 Expanding America’s ports means expanding America’s exports. And more exports mean more jobs. Exports already support nearly 10 million U.S. jobs, including one in three manufacturing jobs, and positions supported by exports pay about 15 percent more on average. The president launched the NEI in 2009 with the goal of doubling exports by the end of 2014, supporting several million jobs. U.S. exports increased 14.5 percent in 2011 to a record $2.1 trillion. That’s the second year of double-digit growth, ahead of schedule to achieve the goal of NEI.